They always go to the same place because they can’t think of something new. Resolution #1. – Either Google “New restaurants (or stores, etc) in our area”, or use another kind of guide with that information to find new possibilities, like your newspaper. It’s easy to fall into a rut! You go to your favorite restaurant, get dinner and call it a night. But with the world around us growing as it is, there’s no need for that to happen. In our city and I’m sure in most areas of the world, new businesses, walking/biking paths, books stores, and restaurants are popping up every year, giving opportunities for new adventures. Recently our local newspaper published their 2017 Reader’s Choice Awards. In it are Restaurants with the best french fries, Asian foods, barbecue ribs, pies, doughnuts, desserts, coffee, Stores including gift stores, department stores and book stores. It goes on and on, listing the best of all kinds of fun places to shop, eat, be entertained or pampered. I couldn’t believe how many places were recommended that I’d never even heard of! I am writing those places into a book of date idea places. The next time we want to “try something different,” we’ll simply open the book and make a new choice! 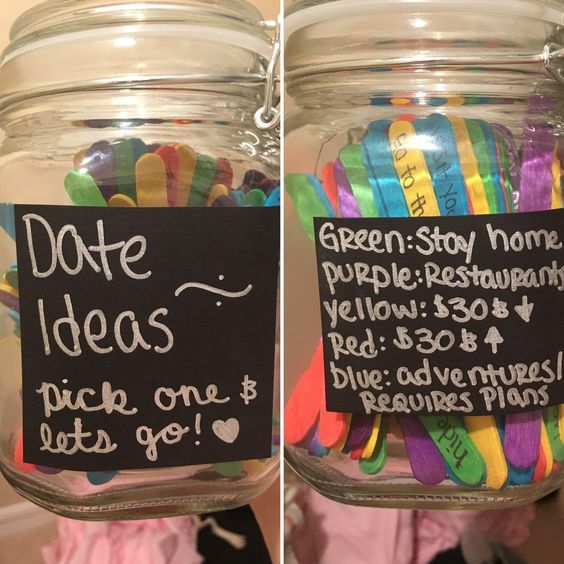 You could also write the names of the places you want to try on Popsicle sticks and put them in a jar. Draw one out and do it when Date Night rolls around. I love this idea of color-coding so you can make a more careful choice regarding price range or planning ahead. Resolution to #2. – Take turns deciding. When it comes down to making the choice of which place you should go, do this – He chooses this week, you choose the next. It takes the pressure off trying to be sure he likes the place, and vice versa. This way, you both get the chance to decide and if it’s not the best, well, next week they can make the choice! Don’t allow boredom or indecision to ruin your date night! Mix it up a little and make the most of the time you take to share a special evening together!